Campus police responded to numerous calls in recent weeks, including three thefts. At around 11 a.m. Sept. 24, Officer Daniel Piazza was dispatched to OCCC’s Capitol Hill Center on SW 25th Street in response to a burglary. A report shows a Shark hot water blaster, valued at $4,000, was stolen from the site, currently under construction, between Sept. 23 and Sept. 24. Later that same day, Officer Jerry Vanwinkle responded to a stolen cell phone report. Student Herlinda Velasco-Ramirez reported her Samsung Galaxy S5, valued at $450, had been taken on Sept. 22 after she accidentally left it in a bathroom stall earlier that day at OCCC’s Professional Development Institute at 7124 S I-35. The case is still active. According to a second stolen cell phone report, an app helped a student track his missing cell phone to a home in northwest Oklahoma City but the phone was not recovered. The iPhone 5S was taken around 4 p.m. Sept. 26 after Student Essa Alhulaymi, 25, left the phone in the Financial Aid area on the first floor of the Main Building. Alhulaymi said he tracked his phone, worth an estimated $500, to an address in Bethany. Officer Patrick Martino called the Bethany Police Department and an officer was sent to the address, but the phone was not recovered. The Bethany officer said a woman and small children were at the address, none of whom attended OCCC. He said several young children were spotted in an empty field behind the house. Campus police have video of a possible suspect, according to the report. The case is still open. On Sept. 25, campus police received a call at 6:48 p.m. regarding a child who reportedly was left alone in the Wellness Center gym. When Officer Zach Andrews arrived, the child’s mother had been located. The mother said she had been in a nearby bathroom changing one child’s diaper while the other child played basketball. In a similar incident, a Pathways student was reported to be missing on Sept. 23. Acting Sgt. Jeremy Bohannon took the report from Pathways employee Catherine Klasek. Klasek said she had been notified by the student’s mother that her son didn’t arrive home after school. The student was later found to be at a cousin’s house. The student’s name was redacted from the report. A medical call on Sept. 29 resulted in one student being transported to an area hospital. Officer Gordon Nelson responded to the call from room 2F2 of the Arts and Humanities Building, regarding a female student, 20, who was having trouble breathing. When Nelson arrived, the student, whose name has been redacted from the report, was sitting just outside of the classroom with an inhaler. EMSA arrived around 8:40 a.m. and transported the student to Oklahoma University Medical Center in Oklahoma City. 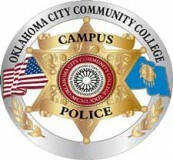 Some information was redacted from the reports under the direction of Marketing and Public Relations Director Cordell Jordan, who said names are redacted “according to OCCCPD Standard Operating Procedures involving information released and information withheld.” To obtain a copy of the procedure, email cjordan@occc.edu. To contact Campus Police dial 405-682-1611 ext. 7747. For an emergency, use one of the call boxes located inside and outside the campus or call 405-682-7872.